Win the Coravin Wine Preservation System Worth £279.00! The Coravin Wine Preservation System allows you to pour wine from a bottle without removing the cork. Whether you want a sip, a glass, or more, your last glass will always taste just as amazing as your first – even weeks, months, or years later. The Coravin Wine Preservation System is easy to use – just insert, tip, and pour. Place the Coravin Wine Preservation System on top of the bottle and push the needle through the cork. 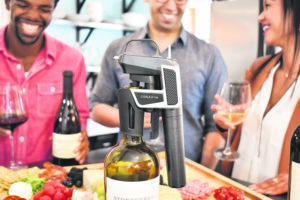 Coravin has also developed a Screw Cap accessory that enables wine lovers to enjoy and preserve bottles sealed with a screw cap for up to three months. So if you like to have just one glass of wine or you prefer a glass of red wine and your partner a glass of white you can now enjoy your favourite wine with opening the bottles.